Session 1: This DVD focuses on desensitizing the horse to noises and quick movements, then sensitizing the horse to become supple and accepting. * Hard to Load on a Trailer? * Spooky & Afraid of Everything? Imagine being able to turn your horse into the picture of obedience! Using Rosa Roca Training Stable's natural training methods, you could do this in just a few short sessions. 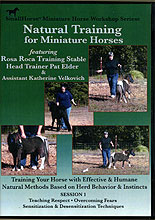 Trainer Pat Elder and her assistant will show you how to work with your fearful, unruly, or just plain disrespectful miniature horse. Using these methods, you can train your horse in a way that is easy for both you and the horse to understand. In the Natural Training Method for Miniature Horses, Pat takes two problem horses through three 30 to 40 minute sessions each, showing you how to lay the foundation for a lifetime partnership with your horse. This is a 3 DVD series, with each session on each respective DVD.